← WNBC Without Chuck Scarborough? NBC Couldn’t Possibly Be That Stupid. Right? Um… right? 20 and Out: WNBC Fires Len Berman. Anything, It Seems, to Save a Buck at NBC. “I do not want to retire,” Len Berman told Richard Huff at The New York Daily News. 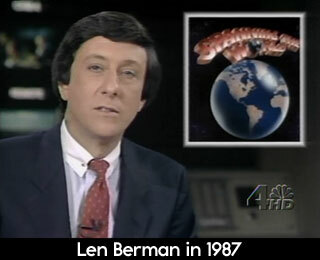 But after 20 years as main sports anchor at WNBC, Berman’s getting the boot, the latest goliath to fall at a station that was once known far and wide for having assembled a stellar collection of New York journalists, many of them, like Berman, a nationally-known name with his appearances on Letterman and his “Spanning the World” segment. But hey, there’s that nasty downside to being a “name.” You know, that oversized salary. So Berman’s gone. Not because WNBC’s eliminating sports, as some other cash-strapped and struggling local stations are doing. This is all about the money. WNBC news director Vickie Burns writing in a newsroom memo: “Going forward, we remain committed to our local sports franchise and will announce new plans for our coverage soon.” You gotta love those “we’ll figure out the rest soon memos. It basically tells you the key thing was getting rid of a superstar and his salary. How they’ll fill the big man’s shoes? Eh. We’ll figure it out. The key thing is we just knocked off a legend and saved a TON of cash. You can almost imagine the relieved high-fiving going on among the suits. That wasn’t so hard! Maybe we should ditch Sue next? On the Daily News website this morning, they’ve got a poll: “Are you sad to see Len Berman go?” The overwhelming answer: “Yes. He’s a New York City icon,” with 84%. You’d like to think this was a not all that funny April Fool’s joke from Channel 4. And then you remember. It’s NBC. No sense of humor. No sense of history. All is forgiven Lenny – Come back to Boston! 20 years is a long time at any company. and do whatever he wants the rest of his life. if he saved some of the money he made, he’ll be alright. maybe even get the h out of nyc. yeech. Well, I would like to see how many EXECUTIVES were FIRED or took a cut in salary.. I don’t care if Mr. Berman earned 10 million a year, you don’t fire a fixture for NBC.. He is NBC for sports. HE is a gentlemen, full of knowledge, dedicated to his job and NBC,a pleasure to watch, not only in the evening but also on the today show..
Well, I will never make a difference to NBC.. BUT I will NEVER EVER watch NBC again..I have watched the today show from the beggining but no more.. Here comes channel 2 or 7. for me.. NBC . you are disgusting !!!! Len Berman was a negative man. I didn’t like his sarcasm. I’m glad hes gone! You will get what you pay for. NYC is not known to be a training farm. It is now. I have already seen in NYC what lower cost talent delivers on the set. There are senior anchors (10 years), and there are seasoned anchors (20-30+) years. The “content center” remake is merely eyewash, and the cheap news will show in the wash at WNBC.